This is a rather intriguing card. On its face, it’s merely Browbeat as an instant; Browbeat has usually not seen much use at competitive tables, except in niche decks that were hyper-linear (even by the standards of burn decks!) where three cards could add up to more than five damage and present a dilemma for the opponent. The thing that catches my attention, though, is that you can use it twice. Jump-start is not true flashback, and it’ll cost you another card to do so, but it does add a wrinkle to your opponent’s calculation. Making the same choice on both castings is likely to be very disadvantageous in most situations. Instant-speed Browbeat you can do twice, though with a bit of a twist. Risk Factor asks that you pick an opponent, not that you let any opponent do it; this alone means you have a bit more flexibility in trying to get Browbeat to resolve. These punisher-style cards rarely see play, though, as you’re asking your opponent to choose which option is less-bad for them. Red’s card draw is notoriously poor, and most will likely opt to take the four to the face instead of handing red a new grip of burn spells. That said, jump-start is an added wrinkle, as is the instant speed on this. You can do this twice, and 8 damage is not insignificant off of a small investment like this. 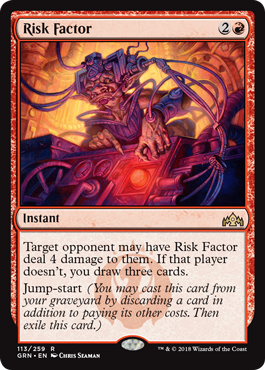 Given the dearth of draw red has to play with, I can see Risk Factor making a small splash in Standard, but temper your expectations with what you hope to get from it.